The Eulophidae are a large family of hymenopteran insects. The family includes the genus Elasmus, which used to be treated as a separate family, "Elasmidae", and is now treated as a subfamily of Eulophidae. Eulophinae are solitary or gregarious, idiobiont ectoparasitoids of the caterpillars, or sometimes the pupae, of leaf-miners, or similarly concealed hosts such as leaf-folders, case-bearers, gall-makers and stem-borers. Many species are facultative or obligate hyperparasitoids through other chalcids, braconids and ichneumonids. Some species (Eulophus and Euplectrus) are gregarious ectoparasitoids of the exposed leaf-feeding caterpillars of large Lepidoptera. A few species of Elasmus have been recorded as primary parasitoids of the larvae of Polistes species (Vespidae). Eulophids are found throughout the world in virtually all habitats (one is even aquatic, parasitising psephenid beetles). The parasitoid wasp Elsmus viridiceps (Thomson, 1878) of 2-3 mm in size, parasitizes the young caterpillars (instar 1 or 2) of The Mallow Skipper (Carcharodus alceae Esper, 1780). 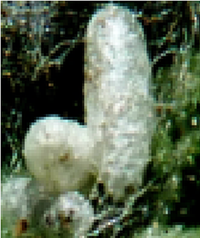 The larvae of Elasmus viridiceps develops outside body of the caterpillar (ectoparasitoid), and prevents further development of its host (idiobiont). Depending of the size of the caterpillar one or two eggs are layed on the caterpillar. After three to four days the larva becomes a dark brown pupa, from which after two days an adult emerge. The parasitized Mallow Skipper caterpillars were found on Common Hollyhock (Alcea rosea).